Tendinopathy is a failed healing response of the tendon, with haphazard proliferation of tenocytes, intracellular abnormalities in tenocytes, disruption of collagen fibers, and a subsequent increase in noncollagenous matrix. The term tendinopathy is a generic descriptor of the clinical conditions ( both pain and pathological characteristics) associated with overuse in and around tendons. Healthy tendons are brilliant white in color and have a fibroelastic structure. Within the extracellular network , tenoblasts and tenocytes constitute about 90% to 95% of the cellular elements of tendons. The remaining 5% to 10% of the cellular elements of tendons consists of chondrocytes at the bone attachment and insertion sites, synovial cells of the tendon sheath, and vascular cells, including capillary endothelial cells and smooth muscle cells of arterioles. The oxygen consumption of tendons and ligaments is 7.5 times lower than that of skeletal muscles. The low metabolic rate and well-developed anaerobic energy-generation capacity are essential to carry loads and maintain tension for long periods, reducing the risk of ischemia and subsequent necrosis. However, a low metabolic rate results in slow healing after injury. Tendinopathic tendons have an increased rate of matrix remodeling, leading to a mechanically less stable tendon that is probably more susceptible to damage. Histological studies of surgical specimens from patients with established tendinopathy consistently show either absent or minimal inflammation. They generally also show hypercellularity, a loss of the tightly bundled collagen fiber appearance, an increase in proteoglycan content, and commonly neovascularization. Inflammation seems to play a role only in the initiation, but not in the propagation and progression, of the disease process. Failed healing and tendinopathic features have been associated with chronic overload, but the same histopathological characteristics also have been described when a tendon is unloaded: stress shielding seems to exert a deleterious effect. Unloading a tendon induces cell and matrix changes similar to those seen in an overloaded state and decreases the mechanical integrity of the tendon. The classic presentation is one of increasing pain at the site of the affected tendon, often with recognition that there has been an increase inactivity. Usually the pain is load-related. In very early tendinopathy, pain may be present at the beginning of an activity and then disappear during activity itself, only to reappear when cooling down if the activity is prolonged, or to be more severe on subsequent attempts to be active. The patient is usually capable to localize the pain rather clearly and the pain is described as ‘‘severe’’ or ‘‘sharp’’ during the early stages and sometimes as a ‘‘dull ache’’ once it has been present for some weeks. 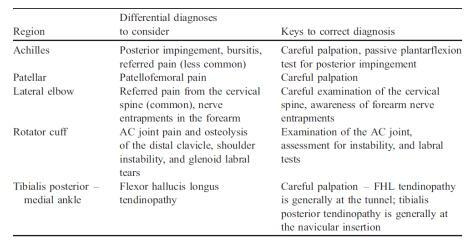 Specific differential diagnoses to consider when patients present with ‘tendinopathy’ at various anatomical regions. Examination includes inspection for muscle atrophy, asymmetry, swelling and erythema. Atrophy often is present with chronic conditions and is an important clue to the duration of the tendinopathy. Swelling, erythema, and asymmetry are commonly noted when examining pathologic tendons. Range-of-motion testing often is limited on the symptomatic side. Physical examination must include tests that load the tendon to reproduce pain and other loading tests that load alternative structures. Corticosteroids improve short-term outcomes but are worse than no intervention or physiotherapy for intermediate- and long-term outcomes for some types of tendinopathy. Evidence is insufficient to evaluate effectiveness of other types of injection. Length of tendon: if the tendon is pre-stretched, its resting length is increased, and there will be less strain on that tendon during movement. Load: by progressively increasing the load exerted on the tendon, there should be a resultant increase in inherent strength of the tendon. Speed: by increasing the speed of contraction, a greater force will be developed. Yet more research is needed to confirm these modalities. Extracorporeal shock wave therapy (ESWT or SW) is a mechanotherapy (high-energy electromagnetic waves) that has recently become popularized for the management of musculoskeletal disorders. It is most frequently applied for the treatment of tendinopathies. ESWT is of interest to clinicians for two reasons. Firstly, it is said to stimulate the metabolic activity of the targeted cells, to promote tissue healing (level of evidence 1b) ; and secondly it is hypothesized to have an influence on the localized nociceptors, resulting in a pain management effect. ESWT is defined as a "...sequence of single sonic pulses characterized by high peak pressure – 100 MP, a fast onset of pressure (<10 ns), and short duration (10 µs). ESWT is conveyed by an appropriate generator to a specific target area with an energy density in the range of 0.003–0.890 mJ/mm2""
The transduction of an ESWT acoustic shock wave signal is converted into a biological signal which results in cell proliferation and/or differentiation via a mechano-transduction process. Most research regarding ESWT has focused on better understanding the mechanisms which results in a mechanosensitive feedback between the acoustic impulses and the specifically stimulated physiological cells. The stimulated cells are said to be the extracellular matrix (ECM)-binding proteins and the nucleus via the cytoskeleton. The mechanisms that enable tissues to recognize and convert the intensity, frequency, amplitude and duration of an acoustic signal into a biological reaction are still not fully understood. The effects of ESWT for pain management is also not fully understood. The mechanical stimulation of ESWT is said to occur with the primary afferent nociceptive C-fibers, and that both activation and sensitization can occur among the localized tissues. Although ESWT is popular within the world of rehabilitation, the scientific support for specific pathologies, including tendinopathies, is still developing. The literature suggests conflicting support for the use of ESWT for tendon injuries. Iontophoresis and phonophoresis involve using ionizing current or ultrasound to deliver medications locally. Corticosteroids and NSAIDS are commonly used with these modalities. Therapeutic ultrasound is commonly used in the treatment of tendinopathy . Despite this, there is little clinical research documenting the efficacy of ultrasound in treating tendinopathy or promoting tendon healing. A majority of in vivo studies have documented the effectiveness of ultrasound treatment. The only areas where ultrasound showed slight promise was in the treatment of lateral epicondylitis and calcific tendinopahty of the suprasinatus, some controlled trials and a systemic review demonstrated a benefit of using therapeutic ultrasound. The Achilles Tendinopathy Toolkit is a comprehensive evidence based resource to assist practitioners in clinical decision making for Achilles Tendinopathy. In general, it would be reasonable to treat a patient with tendinopathy with physical therapy involving a program of eccentric exercises, to be performed for twelve weeks. If the condition does not respond to this intervention, shock wave therapy or a nitric oxide patch might be considered, although data on their efficacy are limited. The use of operative treatment should be discussed with the patient after at least three to six months of nonoperative management. Moreover, patients should understand that symptoms may recur with either conservative or operative approaches. ↑ Maffulli N, Khan KM, Puddu G. Overuse tendon conditions: time to change a confusing terminology. Arthroscopy. 1998;14:840-3. ↑ Williams JG. Achilles tendon lesions in sport. Sports Med. 1986;3:114-35. ↑ Longo UG, Franceschi F, Ruzzini L, Rabitti C, Morini S, Maffulli N, Denaro V. Characteristics at haematoxylin and eosin staining of ruptures of the long head of the biceps tendon. Br J Sports Med. 2009;43:603-7. ↑ Longo UG, Ronga M, Maffulli N. Acute ruptures of the Achilles tendon. Sports Med Arthrosc. 2009;17:127-38. ↑ Longo UG, Ronga M, Maffulli N. Achilles tendinopathy. Sports Med Arthrosc. 2009;17:112-26. ↑ Lewis JS. Rotator cuff tendinopathy: a model for the continuum of pathology and related management. Br J Sports Med. 2010 Jun 11. ↑ Moon, S.W., Kim, J.H., Jung, M.J., Son, S., Lee, J.H., et al. (2013). The effect of extracorporeal shock wave therapy on lower limb spasticity in subacute stroke patients. Ann Rehabil Med: 37:461–470. PMID: [/www.ncbi.nlm.nih.gov/pubmed/24020026 24020026]. ↑ Shrivastava, S.K., & Kailash, K. (2005). Shock wave treatment in medicine. J Biosci: 30:269–275. PMID: [/www.ncbi.nlm.nih.gov/pubmed/15933416 15933416]. ↑ Goodman M, Lumpkin E, Ricci A, et al. Molecules and mechanisms of mechanotransduction. J Neurosci. 2004;24:9220–9222. ↑ Klonschinski, T., Ament, S.J., Schlereth, T., Rompe, J.D., & Birklein, F. (2011). Application of local anesthesia inhibits effects of low-energy extracorporeal shock wave treatment (ESWT) on nociceptors. Pain Med. 12(10):1532-7. doi: 10.1111/j.1526-4637.2011.01229.x. Epub 2011 Sep 14.